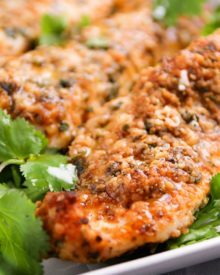 These baked chicken tenders are coated in a deliciously savory crust, yet have zero breading, which makes for an awesomely low carb meal! Eating healthy has never tasted so good! You won’t even miss the breading on these baked chicken tenders… and the flavor is crazy addictive. Who says you can’t have it all? To be fair, I shouldn’t say my “kids”… because my son is the human disposal… he will eat just about anything, and in large amounts! There are some nights I swear he eats more than I do… which honestly, is hard to do… Mama likes to EAT! He is, however, picky about what he wants on certain nights. And my daughter used to be a fantastic eater, and still is, just ohhhhhh my lord is she stubborn!! I shouldn’t even complain because let’s face it, she got it from me… but I’m constantly wracking my brain to get her to eat something that doesn’t come out of a frozen bag. This chicken… it is beyond addictive and you’ll want it alllllll the time! Does that look yummy or what?! But wait, it gets even better! These chicken tenders aren’t breaded… that’s right… no breadcrumbs, no panko… zero bread (bring on the low-carb!). A mix of Parmesan cheese and a variety of spices combine to make the “crust” on these baked chicken tenders. And what a delicious crust it is!! Okay, here’s the breakdown… just mix up your cheese and spices in a large dish and set aside, and melt some butter in a microwave-safe dish. 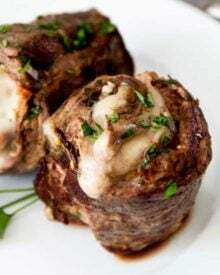 I love serving these with some 3 ingredient slow cooker ranch mushrooms, super crispy parmesan and garlic potato wedges, or a great Caesar salad with homemade dressing! NORDICWARE HALF SHEET PANS – I’m a huge fan of these baking sheets, and own them in quite a few sizes! 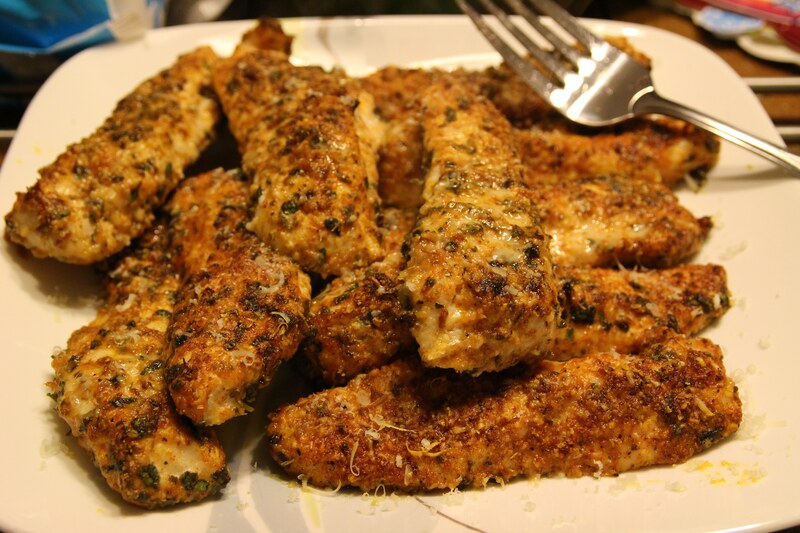 WANT TO TRY THESE LOW CARB CHICKEN TENDERS? PIN THEM TO YOUR DINNER OR HEALTHY RECIPES BOARD TO SAVE FOR LATER! 1. If you're having trouble getting your chicken tenders to crisp up, try placing a cooling rack over the top of the prepared baking sheet and placing the chicken tenders on top of the rack. You can also broil the chicken tenders for a few minutes after they're done baking. This was absolutely amazing! Juicy, tender and flavorful! Absolutely delicious! I coated the chicken rather generously, so I only had enough cheese and herb mixture for 1 1/2 lbs. of chicken. I baked the tenders in my Thermador steam oven for a half-hour on the Easy Cook setting and they came out unbelievably juicy and flavorful! We didn’t care that they weren’t crispy. 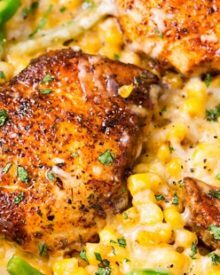 I wanted a quick and easy way to prepare chicken tonight and this one is spectacular in every way. I’m glad I found you, Amanda! I am looking forward to making this dish again soon. I like this recipe but not sure of the nutritional values. In on a bariatric diet and need more info in the low carb tenders. Any way I can get them ? This was easy, quick and Deeeeelissshhh!!!!! I substituted olive oil for half the butter. I think you could go 100% olive oil if you wanted. So delicious. Can’t wait to make again. I only have shredded Parmesan cheese, not grated. Would that make this recipe a no-go? The cheese may not stick as well, but it won’t alter the taste. Can you freeze and reheat these chicken tenders in the oven.. are they just as good?? I haven’t tested freezing these tenders, so I can’t say for certain that the coating won’t be affected. I froze mine and reheated them in the microwave. I thought they were just as good as when eaten fresh from the oven. What are all of the nutritional values beyond calories, such as net carbs, fats, proteins, sugar, fibre etc? 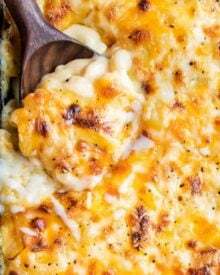 It’s also delicious with greek feta finely shreeded cheese 1/4 cup with 3/4 cup parmesan cheese. Wow!! Ummm, YUM!! This chicken was SO perfect!!!! Is the parsley fresh or dried? I used fresh, but you could use dried, although you won’t need as much if it’s dried. So easy— so tasty!!! Delicious!! My 8 year old loved them!! Thanks! Made this for supper this evening – delicious! Can this be cooked in an air fryer? Hi Betsey 🙂 I don’t have an air fryer, so I can’t say for certain. These things are delicious! I made them a while back, and my grandsons all said they were the best chicken “nuggets” they’d ever had. That really means a lot coming from the youngest, who would only eat McDonald’s nuggets. My eldest son and I eat low-carb, and these were perfect for us. A lot of low-carb stuff has something lacking, but not these babies! This is one of my absolute favorite ways to make chicken. It is always so good and moist. And I love eating it cold the next day! This is crack. I can’t stop eating!!!!! Super easy to make. Thanks a whole bunch for making dinner a blast for my family. This was delicious. I followed directions exactly. After 20 minutes was finished, I drained midtown of the juices from baking sheet, moved to top shelf of oven, and broiled for about 4-5 minutes. Lightly crispy outside, tender and juicy inside. This recipe is a keeper! Do u have an actual carb count? Going to try today!! I’m not a nutritionist, so I don’t provide full nutritional information on all my recipes, as I don’t want to inadvertently give false information. My advice is to copy the ingredients into whatever nutritional calculator you usually use 🙂 The online calculator I usually use shows 3g carbs per serving! I would like to know the macros for this recipe (# of carbs; protein; fats)? How many calories is low calories? I don’t provide full nutritional information on all my recipes, as I don’t want to inadvertently give false information. But the calories are actually listed in the recipe card itself. 581 calories per serving, and my online calculator comes out at 3g of carbs per serving. I make this recipe all the time. I do cut the chicken in smaller pieces/ nugget size and freeze them raw. 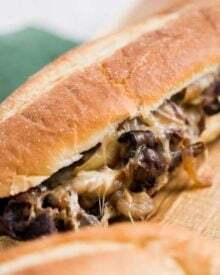 CCONCERNING Rebecca’s remarks to CHUNKY CHEF….. Im glad you apologized for your misguided remarks but if you had bothered to read her entire post; you’d have understood where and why the name of the recipe still applies! Adding her kids to the post was even more tacky than the rude attack toward her about the name of the recipe. She is MUCH more gracious than me because I’d have given you some choice words to swallow down with this wonderful recipe once you tried it. Most people have family or friends who’ve struggled with certain drugs and I’m so sick of the overly sensitive folks blaming a name of a recipe as if it caused the troubles in our country with the drug epidemic! You’d do well to place blame where it belongs and leave a nice lady such as The Chunky Chef alone. It was rude, publicly posted, and was even more low to toss kids into the subject matter. Maybe next time you’ll read and understand her entire POST before having a hissy fit on a public forum. I’ve met too many folks like you who enjoy a war of the words before doing your much needed reading before hand. So again…. glad she handled your remarks so gracefully because I doubt I could have. The recipe will go into my oven tomorrow night and I can’t wait to let my family (and me) enjoy it. Btw…there are many many folks who also die or struggle with alcohol related issues yet chocolate or other delicious recipes are called “Death by Vodka”…i don’t see folks trying to tear a helpful chef down over a name like that…. I’m just really weary of such sensitive people bursting a spring in their head over a recipe name! It takes one vengeful person to nearly ruin all the other positive posts in her forum… pretty sad it just had to be you I suppose and now me because I can’t abide bullies!! Better luck with the mis- informed attitude next time!!! Ramona in Kentucky – what an absolutely wonderful, sensitive, empathetic message. Really, it made me cry, I was so grateful to you for posting it. Thank you from someone who agrees with you 100%. I’m glad she explained the name, but it’s perfectly fine to find the name in poor taste. You assert that people should place the blame on the cause of the problem, but that doesn’t mean that people should go around naming recipes “crack this” or “heroin that” Heroin, FFS! Of course I wouldn’t criticize the Chunky Chef for this as she has rightly changed the name & can’t edit how it shows up on the web, but honestly you really shouldn’t criticize people who find this offensive. I have no idea what the original comment was, and from your response it sounded like it may have been rude & uncalled for, but I have to say again that it’s not appropriate to try to shut down those of us who do find this want-to-be cutesy habit of using addictive drug terminology to name foods distasteful. Those who do this are likely far removed from the cities that have been ravaged by crack, though I suspect less divorced from an environment where opioids have taken the lives of so many. The point is, it’s a distasteful practice to callously use these terms to describe food, & it’s rude to try to dismiss people who feel this way as “overly sensitive”. Again, my comments are NOT directed at the Chunky Chef as she’s provided an explanation & changed the name, but are a commentary on the practice itself & a defense of those of us who are reasonable people who disapprove of it. Bravo, bravo and bravo! Well voiced in such a respectful and classy manner. 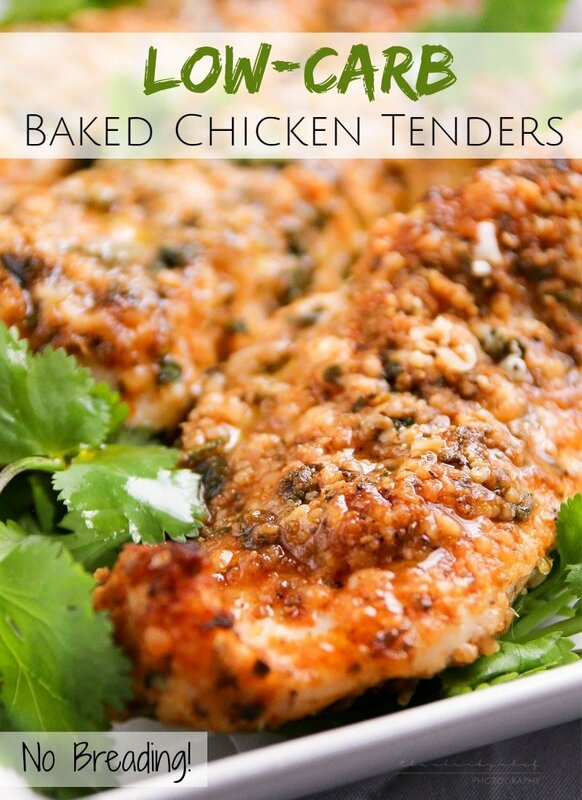 Love your Low Carb Baked Chicken Tenders!! So yummy! What’s the nutritional information on them and I assume this recipe is for 4 servings? Hi Karina 🙂 Since I’m not a nutritionist and don’t want to inadvertently give out false nutritional information, I don’t provide it with my recipes. I encourage my readers to copy the ingredients into their favorite online nutrition calculator. As for the servings, it really depends how many tenders you want. 2 lbs of chicken tenders could be 4 to 6 servings. Amazing amazing!! I’m obsessed have probably have made it 10x in 3 months already!! Both my boys are picky and scoop these up…never any leftovers…. Tried these today! Very tasty! Figured out per piece serving, 215 cal per serving, 0.4 carb, 13.6 fat grams, 24.5 protein. I made this for dinner tonight. It was delicious! My kids loved it! I used egg instead of butter. This is a keeper! Is it just me or when I make them I don’t have enough “batter” lol do I need to measure out the seasonings better? How many carbs per chicken tender? 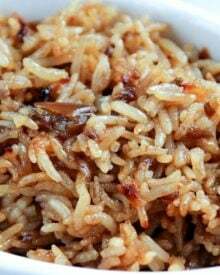 Hi a quick question about the dish can it be cooked in the oven in a bed of rice? These were great. I used the cooling rack while they cooked after checking on them and the bottom was a lttle soggy. They came out perfect. These are AWESOME! Big hit with the family. I did have to put them under the broiler for a few minutes to get crispy. Seriously a great recipe. Maybe it was named that because it was so addictive! Either way, it’s amazing!! Thank you for sharing and I’m sorry many have blasted you. I will make this again!! Hello, I would like to try these in my air fryer. Have you tried this way and if so any tips? Thank you in advance ! Hi Melissa 🙂 I’ve never used an air fryer, so unfortunately I don’t have any tips. Good luck though! Great for my KETO diet. Made it and it tastes GREAT!! Does this call for fresh or dried Parsley? I use fresh, but dried would work too. Do these reheat well? If so, would you hear them in the oven or microwave? Can you use I can’t believe its not butter instead of regular butter? Hi Jennifer, I’ve never used it, but it might work alright. Thank you! These were awesome! I will be making them again and again! The only thing I can add is that I used 1.5 lbs of chicken tenders and needed to make an additional half recipe of the cheese/herb mixture. Maybe I was a little heavy-handed with it, but they are fantastic! Wow. This was easy and quick! I used a cooling rack and broiled my tenders for the last five minutes, and they were juicy and delicious. Glad this popped up in my feed! Smoking good chicken! Your dinner time issues with your kids… mirror mine 100%. So, I had to try it and i am so happy i did. The kids LOVED IT! Thank you so much! I just made Low Carb Chicken Tenders. They are wonderful! Thank you for this great recipe. Hi, I was trying to add this recipe into an app on my phone -myfitnesspal because I was planning to cook them but wasn’t sure if they would show up in a food search so I was going to just save myself the trouble. However, when I tried to put it in, it was saying that 2 pounds of chicken tenders yields 2 servings… I kept trying to edit it but it isn’t working. Is there a way to enter this to get it right? I know a standard chicken breast of 4 oz. is a serving so I thought tenders would be the same. I would appreciate any help if someone else reads this and has done the same. Hi Kimberly 🙂 I’ve never tried, but if you do, I’d love to hear how it went! Was wondering if the cheese is fresh grated parmesan or grated in can. What is the nutritional information on this? What is the nutritional info ? Carbs ? 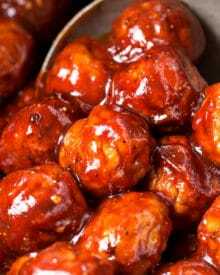 I want to make these, tonight, yum! I know hubby will want to throw them into his new “toy” the deep fryer… Think these would hold up? I was thinking to toss a little crushed pork rinds into the “breading”… can’t wait!! Hi Sandra 🙂 I’ve never fried them, but I think adding some crushed pork rinds to the “breading” would work really well! Follow up! Made these, they were amazing!! I must never lose this recipe, thank you!! My son was just diagnosed with type 1 diabetes and we are having do make everything low carb. Your recipes have been great and he loves the chicken tenders probably more than he enjoyed how I used to make them. Thank you for the recipe. Mine are in the oven now as smell wonderful. What would you recommend as a dip for these? New to low carb so I am excited!! Thanks! Can I ask why you don’t just use a whisked egg to bind the dry ingredients /batter to the chicken tenders rather than the melted butter? Hi Sam 🙂 It’s just a different way to “bread” the chicken… you can absolutely use a whisked egg if you prefer. I made these last night, Oh my goodness, they were amazing!!!!! Thanks for sharing the recipe. Hi Debbie 🙂 I’m so glad you loved them!! I found that putting all the dry mix ingredients in a gallon sized zip lock bag made coating the chicken and clean up a breeze! Shake and Bake but without the carbs! Made these tonight . Delicious! The flavor was amazing. I had no problem with the spice mix staying on the chicken. The only issue I had was I only used a little over one pound of chicken tenders but I made the seasoning mix that you used for 2 pounds of chicken tenders. I just had enough of the mix for the chicken I had so I can’t imagine how you could stretch it for 2 pounds of chicken! This is definitely a keeper. I made these for dinner tonight. They were delicious! 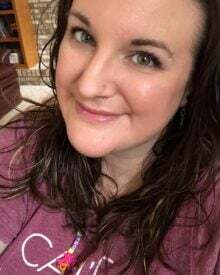 Hi Jennifer 🙂 I’m SO happy to hear that you loved them! Loving this recipe! I eat chicken everyday for lunch. I make ahead on the weekend and take it work. I shock everyone if I don’t have chicken. lol I’m glad I ran across this recipe, it is amazing!! I didn’t have any parmesan so I used grated ricotta instead. I chopped it up to use on salads for dinner. My son tried a couple pieces and loved it as well. He says he wants to take some for his lunch at school. I have another pack of chicken thawing to make more as I type this. Hi Gayle 🙂 I’m so happy to hear how much you and your son love this chicken!! We had a similar recipe but it called for breadcrumbs too. 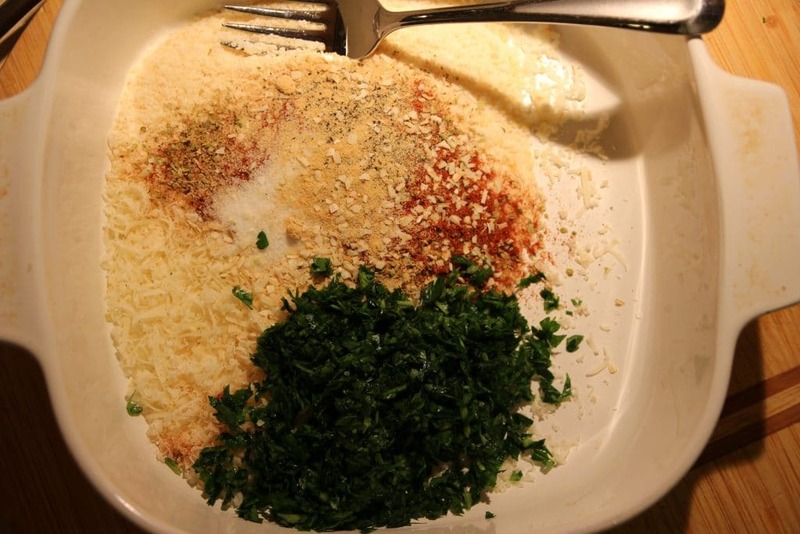 Parmesan is a great addition and/or substitute. My family loved the spice mix you have in this recipe. What I did was mix coconut oil and butter as I didn’t have enough butter and it worked great too. To change this up a little you can add dijon mustard to the melted butter before coating. Gives it a nice tang. If you are feeling like no spices it works great with just parmesan and dijon for flavor. Thank you for the great recipe!!!!! Hi Rachelle 🙂 I love that you used some coconut oil too… I love having that on hand 🙂 Also love the dijon mustard idea. So glad you loved the recipe! A recipe well suited to everyone – low carb or not. Will make extra to slice up for my lunch salads for the remainder of the week. Can’t wait to try this. Hi Allison 🙂 Thank you! I hope you love this chicken… great idea to meal prep with it for chicken salads! So I made this tonight for my husband and in-laws and it was amazing. Everyone loved it! Thank you so much! Hi Crystal 🙂 I’m not a nutritionist, nor do I pretend to be, so I don’t give out nutrition information. There are a large variety of online tools you can easily plug the ingredients into and get the information you’re wanting. Best of luck! I just made this chicken tonight. In fact, I just got done eating it. I doubled the coating part of the recipe for the same 2 pounds of chicken because, well, I have to overdo everything in life…lol. I just have to say it was incredible. I thought I ate a ton of it (and I did) but my husband and son practically licked the glaze off the plate eating this. So so delicious. I will definitely be making this again. Thank you for sharing this recipe. I always have excess of juices when baking my chicken. How do you avoid that in this recipe? Hello! 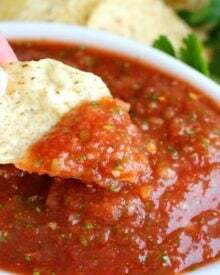 I just tried this recipe, and it is delicious, though it is too salty if you use jar parmesan. I would suggest not adding salt if you use pre-grated cheese. My chicken also left a butter puddle in the pan and did not crisp up. I dumped some of the butter and broiled it, which helpe. I cooked it on an aluminum cookie tray. Next time I may try the wire rack. Thanks for posting! I made these tonight and they were Amazing!!!! Chicken was super tender and juicy with the crust that was perfect without breading!! Thank you. I will definitely make again!! I used the jar Parmesan and Romano combo because I didn’t have fresh Parmesan and it was delicious!! Wondering if you can use the jar parmesan in steady of fresh ? Hi Julie 🙂 I think that would be fine… the texture might be a bit different, but the flavor would still be good. Have you tried using olive oil instead of butter? I can’t wait to try these out. They look delicious! Hi Princy 🙂 I haven’t used olive oil instead, but I think that would work just fine 🙂 Hope you love them! This is the first recipe I’ve gotten anywhere that actually has enough ingredients to coat the chicken. Every other one creates way too little coating, requiring me to stop what I’m doing and make another batch. This is utterly delicious! My picky grandsons and my son couldn’t get enough. My youngest grand (he’s five) said it was better than any chicken he’d ever had. My house smelled mmmmm. I bet my neighbors were jealous. Had they tasted this chicken, they would have been even more so. Thank you for this heavenly recipe. Hi Eva 🙂 I’m so glad to hear that you loved these chicken tenders!! Tried these for dinner tonight and they were absolutely delicious!! They will definitely become a regular around this house. Hi Kara! 🙂 I’m SO happy to hear that you loved these chicken tenders!! Thank you so much for the recipe. I just made them this evening and the butter all melted off and a lot of the cheese came off. Just a big buttery mess in the pan and the tenders are not crisped at all. Followed your recipe exactly and was wondering if you had any ideas what I might have done wrong. Thanks in advance for your help. Hi JoAnna. I’m so sorry it didn’t turn out as you’d hoped, I know how frustrating that can be! Without being there cooking with you, I can’t say for sure, but maybe the “breading” wasn’t pressed into the chicken enough? Do you have the nutritional values for this and how many people it serves? Thank you! What is the matter with some people how many times do you have to say that you tried to change the name!! Hi Pam 🙂 This is one of those posts that definitely brings out some strong feelings in people! Whew… since I changed the title the comments have died down a bit, but yeah, occasionally, enough is enough! loved the flavor of these (and I didn’t have any paprika so had to sub in chili pepper and they were still great). but…mine weren’t so crispy. any suggestions? Hi Christy 🙂 Glad to hear you loved the flavor! 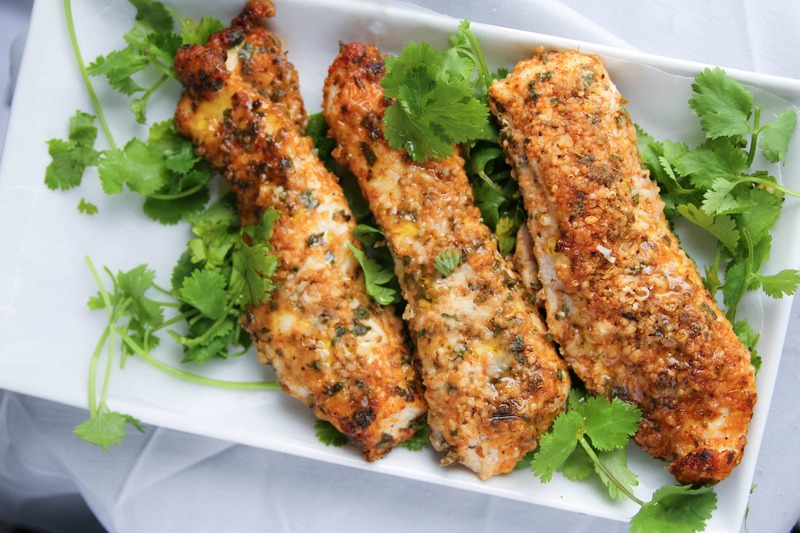 If you found the original method didn’t make for very crispy chicken tenders, alternatively, you could place a wire rack (like a cooling rack) on top of a baking sheet, spray the wire rack with cooking spray and place the chicken tenders on that and bake them. This will allow the hot air to circulate and hopefully get the tenders crispier 🙂 I also love to broil the tenders for a minute or so at the end to crisp up the tops a bit more. Hi. I want to try these but was going to replace butter with egg dip. Has anybody tried this? I made these with butter and also a batch with egg, they turned out pretty much the same, so if you prefer to use egg, feel free! They were delicious, by the way. Unfortunately my family did not like this so much. It looked good, surprisingly crispy for no breading. But they didn’t like all the spices. Had to use my emergency pizza stash! Hi Samantha, thanks for coming by to comment! I’m sorry your family didn’t enjoy these tenders as much as all the other people have :/ Unfortunately, people have different tastes and some don’t like as much spice and flavor as others. Glad you had some pizza on hand though! Food looks good. But I can NOT believe anyone would have the audacity to name a food recipe after a drug that is killing so many of our youth! That part of this recipe is tacky, distasteful and heartless. I tried this and it was awful!!!!! It didn’t even resemble the picture of yours . I’m sorry yours didn’t turn out well 🙁 So many people have made and loved these, so I hate that you didn’t. Unfortunately, without being there seeing you cook, I can’t tell you what went wrong. But we all do have different tastes! Made these tonight. Yummy! Only thing I only baked them for 10 minutes. My tenders were pretty small. They were perfectly cooked. I roasted some peas with them. Fabulous. Thank you! These look fantastic!!! I will def be making them soon due to my uber low carb diet 🙂 Thank you for linking them with us on #foodiefridays!!! They were a hit and one of my weekly features!!! Check it out! Thank you so much!!! I’m humbled they were one of your features 😀 Hope you love them as much as we did! These do look delish! I will be giving them a try! They look yummy. I’d name them something else myself though. Your Heroin Chicken Tenders look fantastic! Thanks so much for sharing with Full Plate Thursday and have a great weekend. These really look fantastic! Thanks for sharing them at Foodie Fridays! 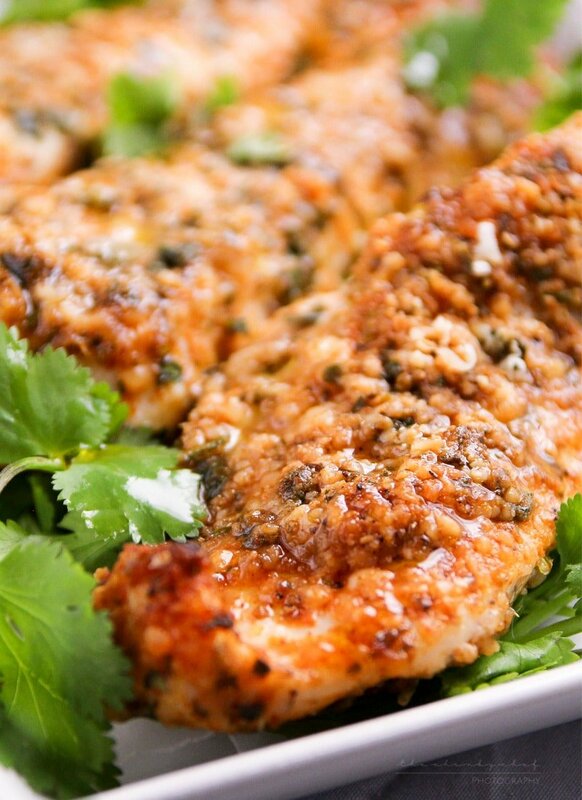 We eat a fair amount of chicken…we’ll definitely try these! Pinning! Thank you so much!! 😀 I hope you love them! I love the spice mix on these! Yum! I’ve pinned this one. 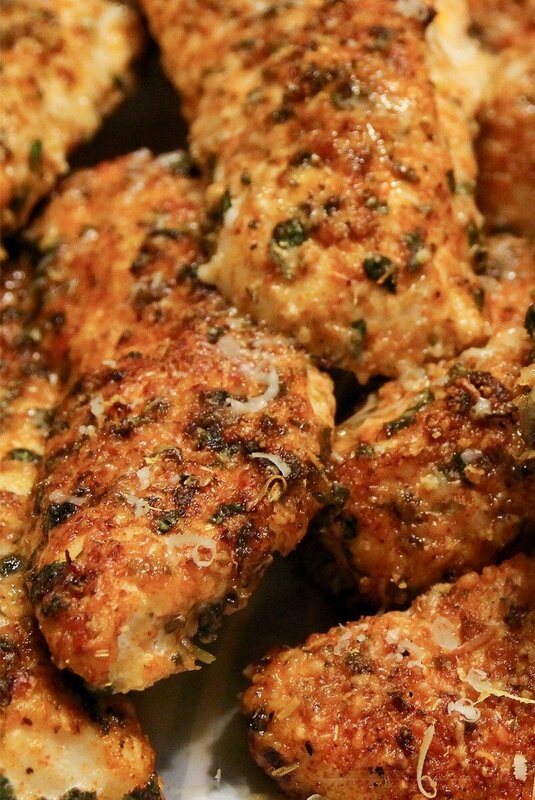 It is impossible to have too many recipes for chicken and these…no breadcrumbs…look wonderful. Your pictures, even taken then next day, are great. WOW! I see myself trying these soon! Love this! So yummy looking! How delicious are these chicken tenders! Love how they are baked too… they look so crisp, golden and delicious. These do sound amazing! I love that they are baked! “HEROIN” chicken tenders? Seriously?? Is that really the message/legacy of cooking you want to leave for your kids? Heroin addiction has become a national epidemic. Every 13 minutes someone dies from a heroin overdose. Sheesh. Very poor taste. I get it. “Crack” has been done to death. However, it’s equally tacky. You’d be better off losing drug references all together. Hi Rebecca, thanks for taking the time to comment. The original name of the recipe, which wasn’t from me, and I DIDN’T come up with (and undoubtedly was named before heroin was sweeping the nation in the way that it is today), was heroin chicken tenders. I have since re-named it Low Carb Baked Chicken Tenders, but cannot change the URL, so unfortunately that part remains. Trust me, I’ve taken more hits for sharing a recipe that I DIDN’T name… your comment about my kids was unnecessary however. Kindly leave MY children out of the discussion, thank you. I am so sorry! It was a very judgmental comment to leave and I do apologize. I saw the word and reacted badly. My family has been devastated by that drug and my reaction came out of that. Please accept my apology. Now, on a food note, the chicken does look amazing and I do intend to try it out. That’s what this blog is about after all. I’m also sorry that you’ve been slammed for the name. Whether it was your name or not, my comment was inappropriate. Thank you Rebecca, I very much appreciate the apology and I am sorry to hear that your family has been devastated by heroin 🙁 That’s terrible. My family has had issues with drugs, although not that particular one. I hope your love the chicken when you try it! Maybe the original name was just spelled wrong,,,and it’s supposed to be HEROINE CHICKEN,,,for a recipe with “good characters”….a winner! The female version of hero is also heroine. Everyone should just shut up and eat the chicken and stop worrying about what it’s called.if you don’t like it then don’t eat it.stop telling people what the should be saying or doing..it’s Food we are not talking about drugs get over it. ??? Everyone should just shut up and eat the chicken!!! Best comment on here!!! ???‍? I AGREE!!! That would be an awesome name for a future cookbook!